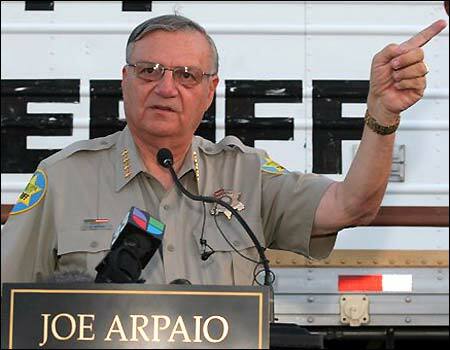 (In)Justice Department Sues Sheriff Joe Arpaio — 1389 Blog - Counterjihad! I would be the first to admit that, both now and in the past, I’ve had mixed feelings about Joe Arpaio, the high-profile sheriff of Maricopa County, Arizona. Be that as it may, this lawsuit is just plain wrong. It is a federal government attack, not only on the sheriff himself, but also on the state and people of Arizona. FNC just had breaking news that the Justice Department is suing AZ Sheriff Arpaio in a civil rights case. The U.S. Justice Department sued Sheriff Joe Arpaio on Thursday, saying the Arizona lawman refused for more than a year to turn over records in an investigation into allegations his department discriminates against Hispanics. The lawsuit calls Arpaio and his office’s defiance “unprecedented,” and said the federal government has been trying since March 2009 to get officials to comply with its probe of alleged discrimination, unconstitutional searches and seizures, and having English-only policies in his jails that discriminate against people with limited English skills. Arpaio had been given until Aug. 17 to hand over documents it first asked for 15 months ago. Arpaio’s attorney, Robert Driscoll, declined immediate comment on the lawsuit, saying he had just received it and hadn’t yet conferred with his client. Arpaio’s office had said it has fully cooperated in the jail inquiry but won’t hand over additional documents into the examination of the alleged unconstitutional searches because federal authorities haven’t said exactly what they were investigating. It’s the latest action against Arizona by the federal government, which earlier sued the state to stop its strict new immigration law that requires police officers to question people about their immigration status. The lawsuit was filed in U.S. District Court in Phoenix and names Arpaio, the Maricopa County Sheriff’s Office and the county. Arizona’s new law — most of which a federal judge has put on hold — mirrors many of the policies Arpaio has put into place in the greater Phoenix area, where he set up a hot line for the public to report immigration violations, conducts crime and immigration sweeps in heavily Latino neighborhoods and frequently raids workplaces for people in the U.S. illegally. Arpaio believes the inquiry is focused on his immigration sweeps, patrols where deputies flood an area of a city — in some cases heavily Latino areas — to seek out traffic violators and arrest other offenders. The sheriff’s office has said half of the 1,032 people arrested in the sweeps have been illegal immigrants. Last year, the federal government stripped Arpaio of his special power to enforce federal immigration law. The sheriff continued his sweeps through the enforcement of state immigration laws. In a separate investigation, a federal grand jury in Phoenix is examining allegations that Arpaio has abused his powers with actions such as intimidating county workers by showing up at their homes at nights and on weekends. …This time, the lawsuit is against Phoenix area Maricopa Community Colleges for (if you can believe this) requiring noncitizens to provide their green cards before they could be hired for jobs. Up is down, black is white, night is day…I’m not sure how much more of this the country can take…. And, of course, they’re suing the State of AZ for enforcing immigration laws with SB1070. An AZ Sheriff recently opined, “Our own government has become our enemy”. The federal government is “at war” (litigation war) with Arizona. Does the rest of America care? Not much. Some of us in other states do. But overall most Americans just don’t give a d***. America is not united much these days. Previous post: Don’t Try to Tell Me Obama Is Not A Muslim!